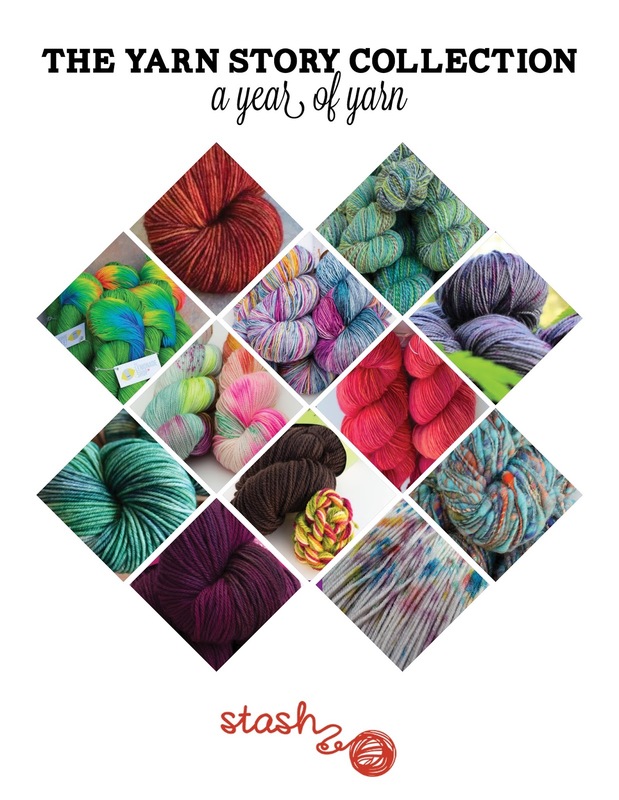 2016 was the year of the Stash Yarn Story Collection. As the consumer it was a really fun project, with each month building to the release of an exclusive colorway with an indie dyer or spinner. 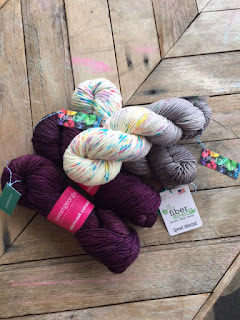 Some I had already heard of and loved (hello Spincycle Yarns) and some were new to me. Either way, it was a special colorway, and an accompanying interview with the artisan to get a little peek into their process. I can't even remember which social media connection brought Sonia Ruyts, owner of Stash Local in Corvallis, to my attention but I'm oh-so-glad that it did. Her genuine enthusiasm for not only fiber artists, but people pursuing their passions in general, is evidenced in her writing and via her podcast. Once the last selection of the year was announced, I waited eagerly to see if she planned to continue the project into 2017, but she had something else up her sleeve. On May 15th, you'll be able to purchase the Yarn Story Collection eBook, as well as kits made up of a selection of the limited release yarns featured in the book. The book is a gorgeous collection of photographs, accompanied by interviews with the artists, and insight into Sonia's passion for the craft. I was actually able to purchase almost all of the yarns, and was surprised when I looked through Instagram, how many of them I had already incorporated into projects. If you search the hashtags #StashYarnStory and #YarnStoryCollection you'll be rewarded with a gallery of gorgeous projects. My Prairie Glass Mitts from Huckleberry Knits and the Whitefish Ripples cowl I made with my skein of Bumblebirch Quill in the colorway Trailhead are two projects just waiting for the blocking mat. I'll be sure to share them when they're done! But perhaps my favorite project from my Yarn Story Collection was Shannon Cook's Feyre Shawl. It had held steady in my queue from it's publish date, but I hadn't found the yarn I wanted to use for it, or the time to knit it. 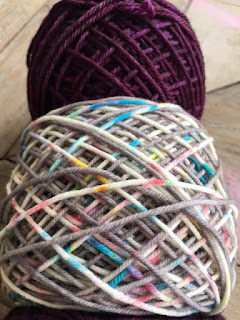 Then came the last two selections for the Yarn Story, and I knew I'd found my combo. Lomo Love by Sweet Georgia is a super deep, jammy purple, tonal in nature with some highlights of an almost bright pink. I wasn't positive they'd be the right fit when the Fiber Seed color was revealed, but I took a chance and was so happy when I opened the package and put the two skeins together. Serendipity is part moody grey, part creamy base with a riot of speckles and together they made the most beautiful shawl. I finished my first full round of Whole30 Thursday. I feel really good, am planning to keep most of the routines we've established and have added a number of the food bloggers I found during my meal planning straight to the top of my rotation. I've been asked by a few people for tips and recipe ideas so I thought I'd do a couple quick posts on the process. One on the food. The other the feels. If you're not familiar with Whole30, it's basically a super strict version of the paleo diet, which was developed first to be an elimination diet to self-test for food sensitivities and give your body a general reset. Full disclosure, and I am the first to admit that I poo-poo'd the plan for a long time. It seems a little crazy to eliminate so many food groups, it's concerning that it wouldn't be a sustainable eating plan for me long-term, so any weight loss or other gains I made during the month could be easily reversed, and I just have a general disdain for anything that smacks of elitism because I'm a reverse snob. Give me a big old truck and some jeans and I'll feel at home. Plop a diet coke in the cup holder? Homier. A month without sugar (including maple syrup, honey, agave or stevia), legumes, dairy (no ice cream?! ), chewing gum (sugar or sugar substitute), alcohol (suuuugar-boo hoo and adios vino), soy or grains. What can I even eat?! Turns out, quite a lot. And it's even good. I had been following the Whole30 Recipes instagram account for some time, and the food they featured there every day all looked so good, and very accessible and I had read the timeline (aka what to expect) a number of times (spoiler alert: I never found the Tiger Blood). I was not interested in adding a bunch of stores to my grocery shopping routine, or quadrupling my grocery budget. There were a few specialty items that I sourced on amazon, but other than that, everything I bought was at Safeway, which is my usual grocery store. I think part of what is intimidating sometimes about the idea of doing a whole30, is that you have to spend your whole paycheck on food. Now, I have a pretty well stocked freezer re: meat and a very full range of herbs and spices, so there were a lot of staples that I didn't have to purchase. I'd add a good $100 if you're going to be buying almond flour, coconut aminos, coconut oil, etc. I would also add some time to your first shopping trip if you're not used to reading labels, because unless you're buying a specific brand that's been listed as compliant, read; they sneak sugar into everything. Costco has a lot of compliant foods now as well, and at great prices. Their unsweeted vanilla almond milk is one of my staples, and their large bags of dried mangos, apricots, dates and figs were great staples to have one hand. (dates and figs are often used to lend sweetness where you'd otherwise be using honey or sugar in some recipes). My husband agreed to take the plunge with me, after some convincing, and we chose the day after holiday break ended as day one. I spent the week or so before starting to cull through my cookbooks and pinterest, and realized that the genius thing about being so late to the party is that the interwebs have done all of the work for you. Honestly, enter 'whole30' followed by any recipe you're looking for in the google search bar or on pinterest and you're in business! I didn't do any big cook-up days, or spend any more time in the kitchen than I previously did. Now, if you are used to grabbing something to go more than a few times a month or eat a lot of convenience foods, then it might seem overwhelming at first until you find your rhythm. I would highly recommend that you have an immersion blender and wide mouthed jar for making mayo, dump ranch and other condiments, and that you prep condiments on an open time that is other than dinner prep. I learned that the hard way when I tried to make ketchup at the same time I was supposed to be basting drumsticks with bbq sauce that was supposed to have said ketchup in it. Secondly, and this is my personal opinion, I think whole30 would be really really hard if you don't like eggs. We went through, no joke, about 12 dozen eggs. Jared did the 30 days with me, so with two adults eating hard boiled, egg salad, shakshuka, over medium, frittata, egg muffins, scrambled, you name it, we were the Forrest Gump of eggs. We also ate a lot of greens. From kale to iceberg and everything in between, this plan is heavy on the protein and greens, light on the fruit and healthy fats, even lighter on carbs (though it's not a low-carb diet). If you don't like to eat salads, this might also be a struggle at first. I did not have any issues with headaches or other symptoms of 'withdrawl' from sugar, other than a general sense of resentment that I was so chubby I had to do this to get a jump start on my path to wellness. But that's for the emotions post. Overall, I just felt good. The first couple days I talked about food pretty much non-stop and my husband finally asked 'Is this going to be one of those things that we talk about food all the time, but don't actually eat any? If so, I'm out.' Okay, message received. From then on I just referred to the menu board when asked what was for dinner, ha ha. I tried to rotate what I had available each week so I didn't get burned out on any one food. I tried Sweet Potato Toasts (pretty delicious), and making my own mayonnaise (I'll never buy it again, so simple and delicious), and the sweet baby angels at Whole Sisters created, and then shared, dump ranch. For which I will be forever greatful. Dump Ranch got me through the first week or so. I actually prefer it to traditional ranch and that is a huge deal. I kept a variety of precut veggies on hand, which made a lot of the roasted veg bases for dinner super simple. Sheet Pan Dinner, which you'll see on the menu board a couple times, is just a couple packages of Aidell's (or I actually found the safeway brand to have a couple of compliant flavors) sausages cut into 1-2 inch pieces, and a jellyroll pan of veggies roasted. During the last ten minutes or so of roasting, add the sausages to the top to warm them through; et voila! Dinner is served. Breakfast was often leftover roasted veg from the night before and a couple over medium eggs. I kept things really, really simple so that it would not feel overwhelming. Once you know what ingredients work, you can adapt regular recipes, but there are so many great resources for already whole30 compliant meals you don't need to. I don't want this to be a novel, but I need to address coffee. I will never love black coffee. I take my coffee with a splash of half-and-half, so I needed a substitute. Some ideas I tried were cashew, almond and coconut milks, all unsweeted and carrageenen-free. They were all fine. But just fine. I found success finally with nutpods creamer, which is half coconut, half almond milk and comes in orginal, vanilla and hazelnut and had to be ordered on amazon. RX bars were also something that I kept on-hand for mornings that were just crazy and I didn't want to skip breakfast. They have a whole30 compliant mixed case that was available on their website with a 20% off and free shipping deal so I snapped them up. They are fairly expensive purchased one at a time, but the bulk deal made them just over $1ea. My faves were blueberry and chocolate sea salt. Without further ado, my meal plans. I only planned dinners, as lunch was either a salad or leftovers. One night I ended up having to scrap what I'd planned and make something faster, but I moved that to the following week's plan. All of the recipes turned out really well (except sweet potato fries, I've tried every trick and they just don't work out for me). Look below the plans and I've linked where applicable! On taco night, I simply had taco salad instead of a shell. Other than that I didn't add any starches to the kids' dinners. Caulirice can be found already riced in bags in the produce section. Whole Sisters; dump ranch, zuchini bites, BBQ drumsticks, and dump ranch. Oh, did I say that twice? Are you contemplating a Whole30? Any other questions I can answer? Stay tuned for my post in the next couple days on the feels. Because it turns out this was more about meal planning and keeping sugar out of my gob. There was some real work to be done! Today on Modern Mrs. Darcy the topic is the things that are saving your life right now. Sometimes it's hard to look past all the things that are killing us, or making life hard, so here is my quick list of the things that are saving me right now. Please note these are all fairly materialistic, everyone in my family is in good health and we're all safe. This list is just meant as a fluffy escape. 1. Whole30: I'm going to write a separate post about this, but today is DAY THIRTY for me, and I survived. Dare I even say I thrived? If you're not familiar, Whole30 is essentially an even more strict iteration of the Paleo diet, which I've rolled my eyes so hard and so long at I think they're kinda stuck that way. Thirty days of zero dairy, grains, legumes, sugar (including honey, stevia, agave and maple syrup), chewing gum, and happiness. kidding on that last one. kind of. The point is to reshape your relationship with food and eating to fuel your body instead of feeding your happiness/sadness/boredom, whatever the blue plate special may be. I thought for sure I'd be chomping at the bit to shove my face full of all the things that were on the negatory list for the last month but the truth is, I feel great! I did not find the promised tiger blood, but that's probably because I'm more unintentional tiger mom, and that shizz is exhausting some days. My kids ended up eating a lot better because the only day they had dessert all month was when I made dinner for someone else and saved a few brownies back for them. 2. Beachbody workouts and a treadmill: Pairing a consistent commitment of 30-50 minutes a day in my schweddy basement with Whole30, I've started down the path of a healthier and stronger me. From December 5th to today, my before and after photos make me happy. Having the flexibility to work out around the schedule of my life has been invaluable. 3. Audible and my Paperwhite Kindle: I've missed having the luxury of time to read. With Audible I've blown through several books in the last month, simply because I can listen while I'm cooking dinner, folding laundry, waiting at one practice or another. I highly recommend listening to anything by Joshlyn Jackson because she narrates them herself and her inflection is perfection. I have learned to listen to the sample before purchasing because I couldn't get past the first chapter or so of Curtis Sittenfeld's Eligible. The narrator was awful with a capital A. The kindle, specifically the paperwhite, enables me to take a bunch of books on the go, but without the distraction of social media lurking in the background. 4. Dry Shampoo. For reals. Dry shampoo can take you from messy hair, actually do kinda care thank you, to presentable and ready to rock your day in about 5 minutes. I have learned to embrace the fact that washing your hair every day doesn't do your locks any favors, especially when your hair is as processed as mine. I just picked up the new Doo.Over by Kevin Murphy. It smells good and works really well without leaving your hair feeling dry. 5. Podcasts. Much the same as Audible, they're something I can listen to on the go, and I've especially started listening to them while I knit in the evening as opposed to watching Netflix. The ones I'm currently digging the most are Pantsuit Politics, What Should I Read Next, NPR Politics, My Favorite Murder (very guilty pleasure. see what I did there? Guilty? #sopunny), Sweet Georgia and Stash Local Podcast. Find them on iTunes or however you listen in! 6. Driving a beast of a rig. I got in an accident last week that could have been much worse had I not driven a large, super safe car. Between the car's design and good, properly installed carseats, we were both totally fine, just carless for a day waiting for the other driver's insurance to come through on a rental. 7. Last but not least: Knitting. knitting and working with yarn seems to both fuel and soothe my soul these days. I'm participating in the Yarn Love Challenge on instagram this month, which features a different photo challenge each day, you can follow me there!